The Pictures are of the actual item you will receive. BATMAN THE KILLING JOKE THE DELUXE EDITION written by Alan Moore & illustrated by Brian Bolland. Intro by Tim Sale. New York, NY; DC Comics; 2008. 16th printing. Fine in fine dj. But we will cooperate as much as we can to get your product to you as soon as possible. DC Watchmen by Alan Moore. New, over 400 pages. New, Great story! Over 400 pages! It will truly be an edition for the ages. Exquisite, thoughtful, and human. For more than a century, Alice, Wendy, and Dorothy have been our guides through the Wonderland, Neverland, and Land of Oz of our childhoods. Great cop y slight cover creasing. Watchmen by Alan Moore (2014, Paperback). Condition is Like New. Shipped with USPS Media Mail. Excellent condition, good cover gloss.Read once then shelved. Now available for sale. Author: Catling, Brian; Moore, Alan [Foreword]. Notes: Scarce, Author's first book Signed/Numbered (advance) by author on front endpage, 150/300, see scan. Fine condition, appears unread. Publisher: Honest Publishing. Alan Moore, Dave Gibbons. Hardcover Book. But is Rorschach really insane or has he in fact uncovered a plot to murder super-heroes and, even worse, millions of innocent civilians?. "V for Vendetta" by Alan Moore and David Lloyd - Softcover (6-5/8" x 10-1/8") Graphic Novel - Published in 1990 by Vertigo (10th print) - 286 pages in full color - EXCELLENT condition. Set in a futurist totalitarian England, a country without freedom or faith, a mysterious man in a white porcelain mask strikes back against the oppressive overlords on behalf of the voiceless. 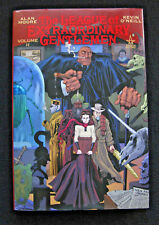 SIGNED x 2 Voice of the Fire by Alan Moore Limited Top Shelf Edition #201/500 - signed by the author and the illustrator. Stated First Printing. This hardcover is in good condition and the dust jacket is also. The condition of wear is that the top pages of the inside of the book. Also on the inside cover, front top right cover, there is a single pen. G. Wells. Written byAlan Moore. of issues6. Collected editions. Kristy Quinn. Editor(s)Scott Dunbier. Colorist(s) Benedict Dimagmaliw. Letterer(s) Bill Oakley. There are curled pages and hard cover on the edges of the top right hand. The Pictures are of the actual item you will receive.